Kandahar Street houses a few unique cafes that are popular among the younger café-hopping crowd like Maison Ikkoku but fans of old-fashioned confectionery will tell you that the place to visit when you are at Kandahar Street is Dong Po Colonial Café. Upon entering Dong Po, you will find that the unique interior decor is a fusion of Nanyang (as colonial Southeast Asia was known as) and colonial elements. The café can seat up to approximately 30 people indoors and an additional 10 people in their outdoor seating. 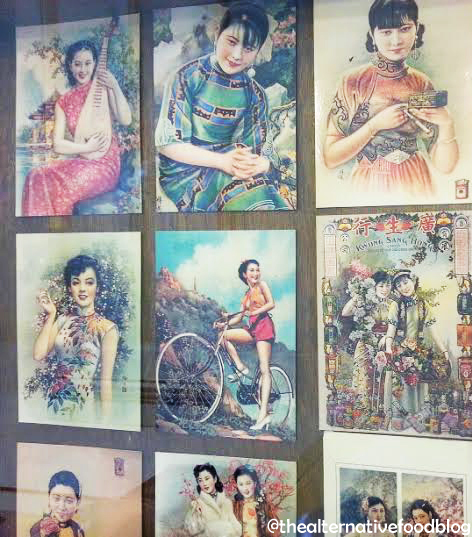 The tables in the café are decorated with nostalgic memorabilia, such as wedding candles, postcards with painted pin-up girls, and toys from our parents’ childhood. What has really propelled this café to fame is more than just its unique décor and display of memorabilia. Rather, it is Dong Po’s repertoire of old school cakes and breads that has driven many to wake up at 8 am in the morning just for breakfast. Shereen and I, along with two close friends, knew we had to order their signature cakes and their famous Almond Toast. Since Dong Po is not Halal-certified, and Shereen had already filled up on nasi lemak at the nearby sarabat stall, she left the food tasting to us. Between the three of us, we ordered a slice of Strawberry Lamington Cake, Apple and Aloe Vera Cake, Strawberry Mousse Cake, a Butterfly Cupcake, two sets of Kaya Toasts, a slice of Almond Toast, Milk Tea “Teh”,and Black Coffee “Kopi-O”. 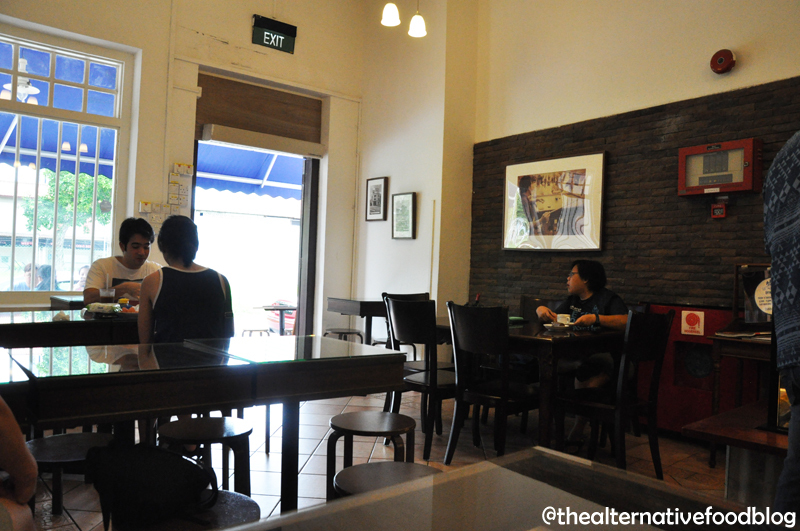 Do note that set meals are offered at a price range of SGD 2.90 – SGD 5.00. Each set comes with a tea/coffee and either toast, pastry, and/or eggs, depending on your choice. We ordered two SGD 5.00 set meals, which came with a hot beverage, and two slices of cake each and we also ordered additional coffee and toasts on the side. I was curious about the taste of Dong Po’s version of the Strawberry Lamington Cake. Traditionally, the Australian Lamington is a cube of cake dipped in chocolate icing and coated with desiccated coconut. Dong Po however, chose to adapt the recipe with their own twist by dipping their cubed cake into a layer of agar-agar before coating it with coconut shavings. My first impression when I tasted the cake was that it tasted similar to a local delight – ondeh-ondeh. The layer of agar-agar that coated the sponge cake added an interesting texture to a traditional sponge cake, and the fragrant coconut shavings gave the Strawberry Lamington Cake a different layer of flavour. However, despite its pink appearance, I couldn’t taste any strawberry in the cake and that was rather disappointing for me. Otherwise, this reinvented Strawberry Lamington Cake is definitely worth a try. The next cake I tried was their Butterfly Cupcake. The cupcake is named “Butterfly” because of its resemblance to a butterfly with its wings spread open. Two cuts are made diagonally on the top of the cupcake where cream is then used to fill in the pockets created and a preserved cherry is used to decorate the cupcake. Taste wise, this pretty cupcake is dense and too coarse for my liking. The cream used to fill the pockets is thick and reminded me of those used on cakes we used to eat when we were young. In fact, one of my friends (who has more experience in food tasting) remarked that the cakes reminded him too much of his childhood. Though the cupcake is plain, it is its simplicity that creates a nostalgic taste. My friend ordered a slice of Apple and Aloe Vera Cake. The cake is layered with fresh cream, and topped with Dong Po’s homemade apple and aloe vera jam. The cake on its own tasted like the cake used in the Strawberry Lamington Cake. It was plain, and frankly, a little coarse as compared to cakes from similar old school bakeries. What differentiated this cake from the other cakes we ordered was the spread of apple and aloe vera jam. The jam was tangy and slightly sour, providing a good balance to the fresh cream, and it gave the cake a hint of apple and aloe vera flavour. Next, we tried the Strawberry Mousse Cake. This pretty cake, with layers of strawberry mousse, and a layer of strawberry flavoured jelly on top was pleasing to the eye. Unfortunately, the layers of sponge cake tasted exactly like the cake used in Strawberry Lamington Cake and Apple and Aloe Vera Cake – which led us to conclude that Dong Po probably uses the same cake base for its cakes, differentiating the flavours with its cream and jams. The Strawberry Mousse Cake, in my opinion, tasted better than the Apple and Aloe Vera Cake. The strawberry mousse that was spread between layers of plain sponge cake was smooth and rich with the taste of strawberries and added to the sweet and nostalgic taste of the cake. Apart from cakes, we also ordered Kaya Toast and their signature Almond Toast. The Kaya Toast was unlike the kaya and butter toasts you can find at Ya Kun. White bread was used and it was lightly toasted, thus making the toast slightly soft in the middle. The kaya spread was fragrant and smooth, and its sweetness was not too cloying. The last item we sampled was the signature Almond Toast. Though the name almond toast might suggest a piece of toasted almond bread, it is, instead, a piece of buttered white bread, toasted with almond flakes, and sprinkled with a generous amount of icing sugar. The toast was buttery and crispy on the outside while the toasted almond flakes gave the toast a nutty flavour and a satisfying crunch. If there is one item you have to order when you visit Dong Po, this will be the toast you have to try. We washed down the cakes and toasts with Milk Tea “Teh” and Black Coffee “Kopi-O”. We were slightly disappointed with the Teh because even though its fragrance seemed promising, it was not as milky as the Hong Kong milk tea we are accustomed to while the Kopi-O was neither too bitter nor was it too strong. Initially, we were disappointed with the mild taste of their beverages but on hindsight, the Teh and Kopi-O were probably meant to be mild, so that they can complement the taste of heavy cream and jams in the cakes. 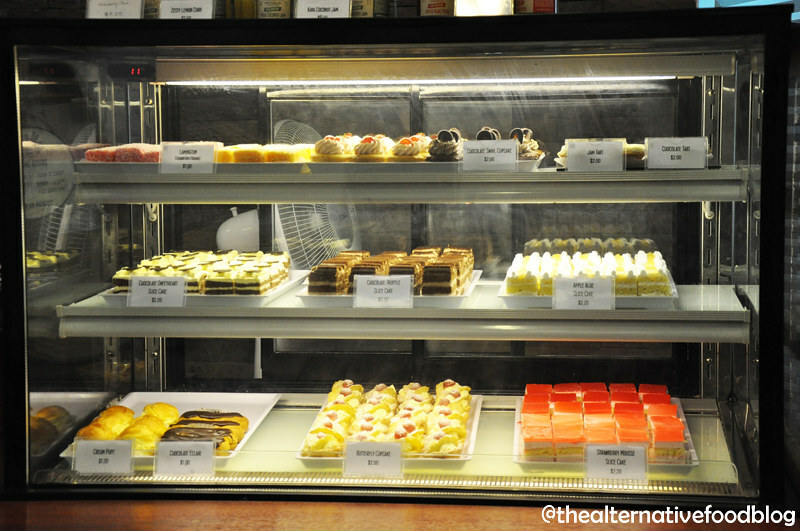 It was a pity we weren’t able to sample more of the cakes and pastries offered. Perhaps, we would have discovered tastier pastries that draws the crowd to Dong Po. However, judging by the crowd of mature diners at Dong Po, perhaps, it really isn’t about Michelin-worthy cakes and gourmet coffee, but the memories of a simpler Singapore that makes Dong Po a successful cafe. Vegetarian Options: Their mains are served with meat. Cakes and pastries are suitable for ovo-lacto vegetarians. Our verdict? ♡ ♡ and a half / ♡ ♡ ♡ ♡ ♡ (2 and a half out of 5 hearts).